Search engine optimization is so important for marketers, but it can be a pretty tricky tactic to master with Google’s copious algorithm updates. What matters, and what doesn’t? What’s best practice, and what’s old-school? How can I remember it all, anyway? We understand this is a common issue facing inbound marketers — and we want to help. 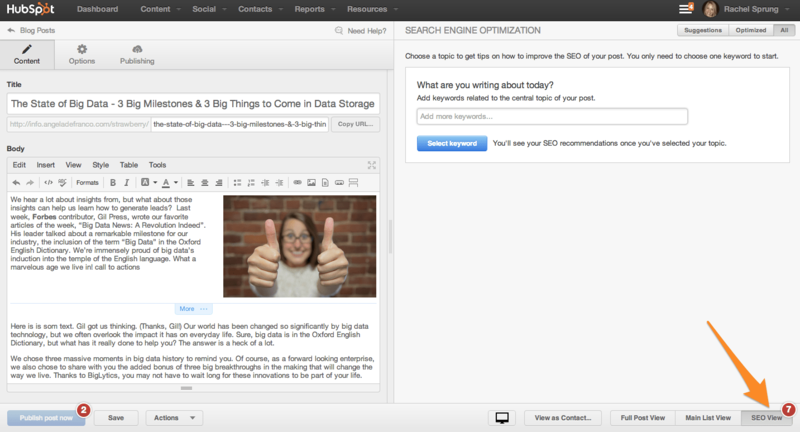 Today, HubSpot has launched an SEO Panel that will help take you through how to optimize your blog posts as you’re writing them. The SEO Panel lets you know in real-time what you need to do to optimize your posts for the keywords you care about, and what you’ve already succeeded in doing for your in-post SEO. Below, we’ll cover some of the suggestions from the SEO Panel, along with a few other optimization tactics you should keep in mind. Note that this list does not cover every single SEO tactic. Rather, these tips are meant to get you started with improving SEO for your blog. 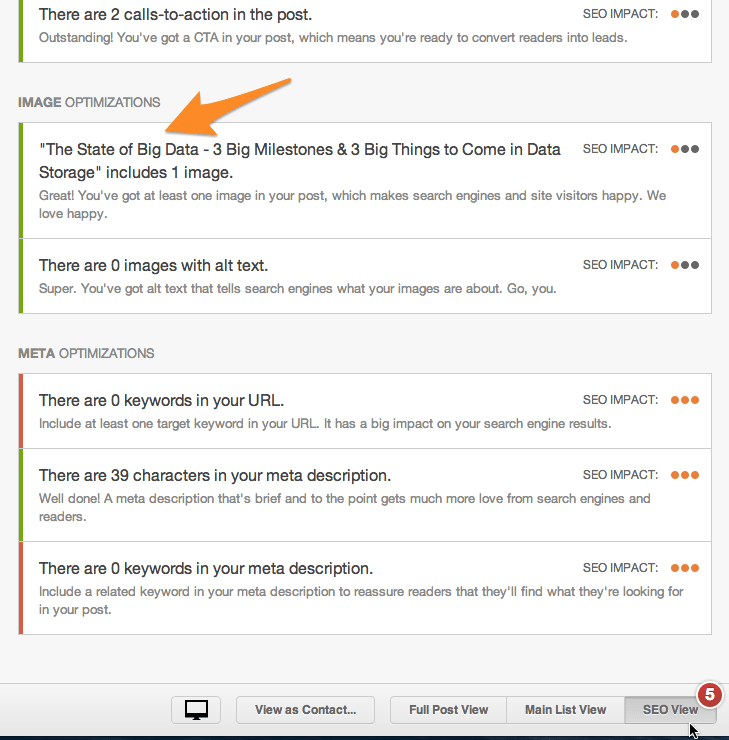 If you’re a HubSpot customer, you’ll receive these reminders right in your post dashboard — just select the SEO View. If you’re not a customer, you can use this checklist as a reminder as you blog. When writing for your blog, it’s important not to stuff a ton of your keywords into a single post. 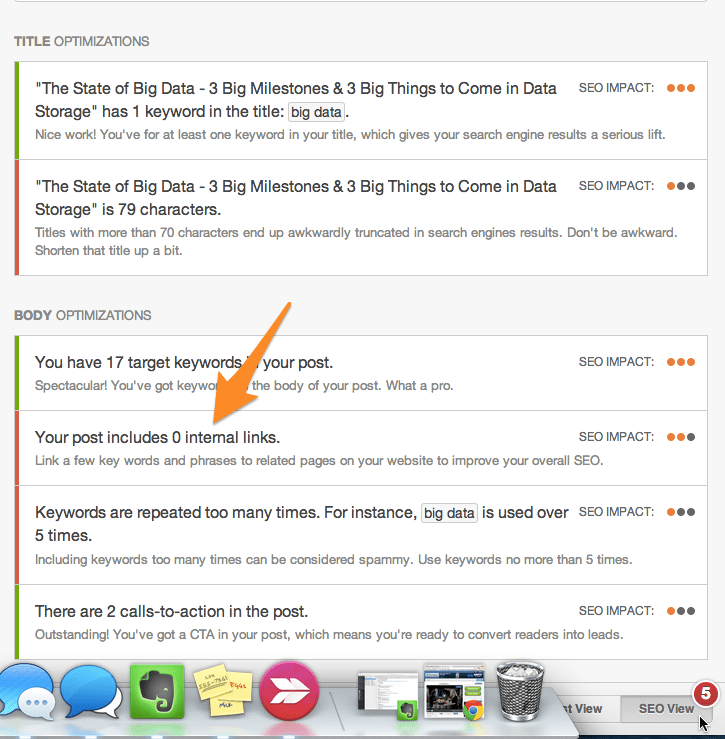 Instead, focus on 1-2 keywords for each post. It’s best to limit keywords to this total because 1) search engines will actually penalize your post if it looks like you’re using keywords too many times, and 2) it helps keep you focused on a goal for your post. Yes, more than one keyword may appear in a post; but the goal of the post should be narrow enough to allow you to spend time optimizing for just one or two keywords. Long-tail keywords may be more efficient to use since website visitors searching long-tail terms will often be more qualified. In other words, you’ll bring in the right type of traffic — visitors who convert — by using long-tail keywords. The title of your blog post should include your keyword, but just be sure to keep your long-tail keyword under 70 characters. The title of your post will be a search engine and reader’s first step in determining the relevancy of your content, so including a keyword here is vital. You should mention your keyword at a normal pace throughout your post — that means you should include your keywords, but only in a natural, reader-friendly way. Search engines penalize any post they believe is using keyword mentions as a way to rank for a particular keyword, so this requires close attention in the writing process. Search engines also look to your URL to figure out what your post is about. Your URL should reflect your title, so ensure the keyword you use is relevant to the article. If you have to trim your blog post URL down, make sure you keep the keyword in it. We’ll elaborate on the importance of URL structures in more detail below. Later in this post, we’ll also dive into explaining meta descriptions. Your meta description is meant to give search engines and your readers information about your blog post’s content. So be certain to use your long-tail term clearly here so Google and your audience are well aware of the post’s content, but also keep in mind that how engaging the copy is matters a great deal for conversion rates. Blogs that are responsive will conform to the screen of any device. That means whether you’re reading a blog on a desktop, smartphone, tablet, or other mobile device, the site format and layout will be the same, making for a unified user experience. Responsive design is becoming more and more important for more than just UX, though. It’s also important for SEO. A recent Google study revealed 61% of mobile visitors will return to Google to find a site that is more easily readable if they can’t find information on mobile sites right away. This makes having a uniform, responsive site imperative. Another reason it’s important to have responsive design set up is that it creates one URL. This helps your SEO because any inbound links that come back to your site won’t be scattered across different domains. Any SEO power you gain from these links will be centralized, helping Google as well as your SEO ranking. All content created on HubSpot’s platform is automatically responsive, so HubSpot customers can breathe easy. Meta optimization is actually not limited to meta descriptions. To review, your meta description is the additional text that appears on your search results that lets you know what the link is about. The meta description is also important because it give readers information they need to decide whether or not your content is what they’re looking for. Your meta description should include the long-tail keyword you are trying to rank for, because if we’re doing blogging right, it’s representative of the contents of your post. In the example above, I searched for “writing a blog post.” The words “write” and “blog post” are both bolded because they were the search terms I was hoping to find. Thus, including keywords here can go a long way in helping your audience identify you as a good option in search. HubSpot customers: In the SEO Panel, you’ll notice SEO Impact is measured for different elements of meta optimization (and all of the items, actually). Optimizing your metadata only takes a moment, so ideally, you’ll hit all the elements of great meta optimization. You may have heard SEO experts say that you should never have duplicate content on your website. However, you sometimes need to display information in multiple ways to help your website visitors navigate your website. Whenever you have duplicate content on your website but need to keep both pages live, you should use canonical tags. Canonical tags speak to search engines and tell them which page to index. Giving them this information ensures that your content is not punished for appearing somewhere else on your website. It also allows search engines to link to the appropriate or dominant resource. Pick the page that you want to be indexed, and write down that URL. If you have any questions, follow these instructions from Google. Blog posts shouldn’t only contain text for SEO purposes — you should also have images that help explain your content. But search engines don’t just look for images. Rather, they look for images with alt text. You can figure out an image’s alt text by placing your cursor over an image. A small box will pop up that describes your image and, therefore, helps search engines interpret the meaning of the image. As you can see below, the alt text is “related-search.” Think of alt text as an interpreter for search engines. Search engines cannot interpret what an image means without the text to explain it. 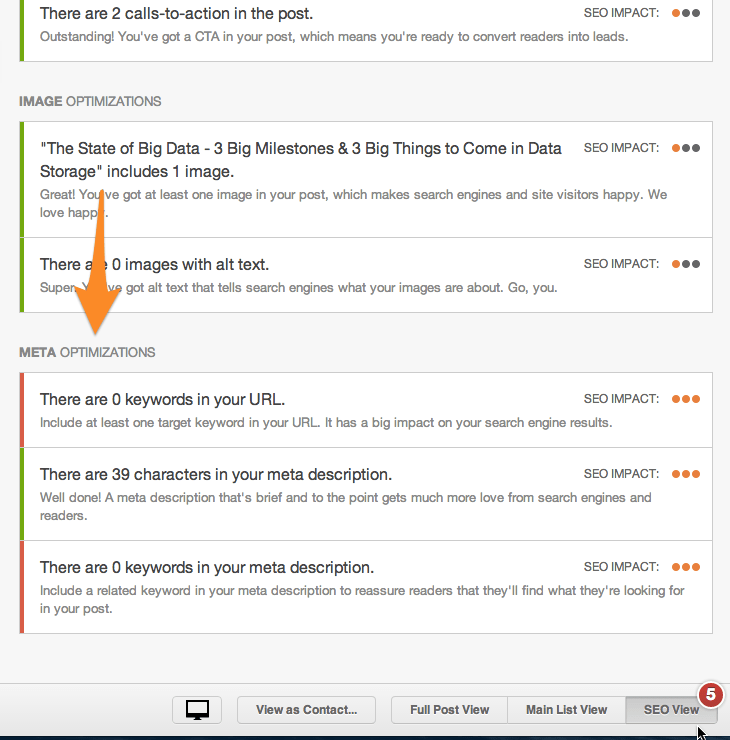 In HubSpot’s COS, the SEO Panel will recognize whether or not you have optimized your images. Though these elements are not as important as some other optimizations, they’re still necessary (and easy to add in). 6) Don’t use too many topic tags. Topic tags can help organize your blog content, but if you overuse them, they can actually be harmful. If you have too many similar tags, you may actually get dinged by search engines for having duplicate content. Think of it this way: When you create a topic tag, you also create a new page where the content from those topic tags will appear. If you use too many similar tags for the same content, it then appears to search engines as if you’re showing the content multiple times throughout your website. For example, topic tags like “blogging,” “blog,” and “blog posts” are too similar to each other to be used on the same post. If you’re worried that your current blog posts have too many similar tags, take this opportunity to clean them up. Choose about 15-25 topic tags that you think are important to your company and that aren’t similar to each other. Then, only tag your posts with those keywords — that way, you won’t have to worry about duplicate content. The URL structure of your webpages should make it easy for your visitors to understand the structure of your website and what content they’re about to see. Search engines favor URLs that make it easier for them and website visitors to understand the content on the page. We’ll start off by coming to the HubSpot blog by typing in this URL: http://blog.hubspot.com/. Now, let’s say we want to head to the Marketing section. The URL would change slightly to: http://blog.hubspot.com/marketing. If we want to read the Sales section, all we have to do is change where it says “marketing” in the URL to “sales”: http://blog.hubspot.com/sales. The structure of the URL acts as a navigation for us, letting us know where we are on the website and how to access new site pages. Search engines appreciate this, as it makes it easier for them to look at the URL and identify exactly what information searchers will access. To find more best practices for URL structure, you can read more about it from Moz. Inbound links to your content help show search engines the validity or relevancy of your content. The same goes for linking internally to other pages on your website. For instance, if you’ve written about a topic that’s mentioned in your blog post on another blog post, ebook, or webpage, you should link to that page. That will not only help retain visitors on your website, but also demonstrate the other relevant and authoritative pages to search engines. If you’re a HubSpot customer, the SEO Panel suggests linking to other internal resources on your website. As you can see below, the Panel states that your overall SEO will be improved by doing this. Think of it as solving for your SEO while also helping your visitors get more information from your content. 9) Use the Google Webmaster tools section. A great resource for finding out more about SEO is Google’s SEO section in Webmaster Tools. This page can likely provide you with answers to a number of additional questions you may have about the best ways to optimize your website, so we recommend bookmarking it.